Preheat the oven to 220 degrees C. Cook the pasta in boiling water for 10-12 minutes, or according to packet instructions until almost al dente.Drain and set aside. Heat the oil in a heavy based saucepan and cook the mushrooms for 2-3 minutes or until softened, stirring occasionally. Tip the cooked mushrooms into the bowl of pasta and set aside. Return the empty pan to the heat. Melt the butter in the pan, stir in the flour, then gradually stir in the milk and bring to the boil. Simmer until thickened. Add the mustard and blue cheese, seasoning to taste and stir until the cheese has melted. 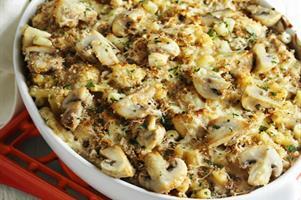 Add the cooked mushroom and macaroni and stir thoroughly. Pour the mixture into an ovenproof dish. Mix the cheddar cheese with the breadcrumbs and sprinkle this over the pasta mixture. Bake for 15-20 minutes or until lightly browned and bubbling hot. Serve immediately.